OUR Harry Kane marked his captaincy of England with the dramatic injury-time equaliser against Scotland at Hampden Park, and it gave impetus to a proud Tottenham tradition that goes back more than a hundred years. The first Spurs player to skipper England was the legendary Vivian Woodward back in 1908, and he was never on the losing side while captaining the team 12 times before moving to Chelsea. Like Harry, he was a free-scoring centre-forward who was considered one of the finest players of his generation. Next Lilywhite to have the honour of leading England was the great Arthur Grimsdell, skipper of the 1921 FA Cup winning team. A silky-smooth left half with a left foot that he used like a conductor�s baton, he captained England three times. Can you name the seven Tottenham players who have skippered England in post-war football? Let me put you out of your misery: Alf Ramsey, Alan Mullery, Martin Peters, Gary Lineker, Sol Campbell, Scotty Parker and, of course, Our Harry Kane. 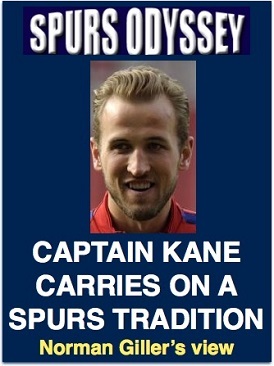 It will be interesting to see if Harry eventually becomes Spurs captain. He would have a rival in Eric Dier, who has skippered every side he has ever played for from his schoolboy days. I cannot let my ramblings go without mention of the part Kyle Walker-Peters and Josh Onomah played in England�s Junior World Cup triumph in South Korea yesterday. Both are gold-plated prospects and wonderful advertisements for the Tottenham Academy. Meantime, well done Captain Kane. Like Walker-Peters and Onomah, you are a credit to our club. Thank you. Now Our Harry comes up against Our Hugo in France tomorrow for the Battle of the Tottenham Captains. They are good friends but will be going all out to get the better of each other. May the best man win! One is sure to be magnifique the other magnificent. Before we go down memory lane for the second instalment of the Golden Double story, I would like to point you in two different directions for topics of interest for all true Tottenham supporters. First, please find a few moments to join the campaign for recognition for Bobby Buckle, the man who could arguably be called Mr Spurs. Without him, it's likely there would have been no Tottenham Hotspur. Now there is a movement to give him the status he deserves with a Blue Plaque at his Tottenham home that once served as the club's headquarters. Read all here (http://bobbybuckle.co.uk/index.html) and please give your support. COYS! You will find a riveting article on Keith by California-based, Welsh-born journalist Ashley Collie, a dedicated Lilywhite who belongs to the enthusiastic and knowledgeable LA Spurs. They hosted a dinner for Keith and his wife, Jackie, last week when the couple stopped off in swish Beverly Hills during a holiday train tour of the States. For anybody who was around during the memorable Burkinshaw reign as Spurs manager, you will find his views on Tottenham then and now fascinating. A must read. Remember that it was Keith who revolutionised British football by bringing in Argentine aces Ossie Ardiles and Ricky Villa. It really did take two to tango. Eyes down for Part Two of our visit back to the greatest season in Tottenham�s history, the remarkable record-breaking Double year of 1960-61. On the 50th anniversary of the FA Cup victory over Leicester at Wembley, I combined with entrepreneur and life-long Spurs supporter Terry Baker to produce a limited edition book of the Golden Double, that was introduced and autographed by Braveheart Dave Mackay. BLACKPOOL, including the immortal Stanley Matthews on their right wing, were no match for a Spurs side that quickly got into its rhythm. Matthews was 46 years young, and still a wizard of dribble and soon set for a return home to Stoke and a glorious ending to his fairytale career. He was superbly marked by left-back Ron Henry, who allowed him few opportunities to show the now-you-see-me-now-you-don�t-runs that had made him a footballing legend. QUOTE � Ron Henry: "I had made a close study of the way Matthews tricked his opponents, and noticed that most defenders watched his body rather than the ball when marking him. He could throw them off balance with a dip of his shoulder or a double-foot feint, but I noticed that the ball usually stayed in the same spot. So I kept my eyes riveted on the ball, and most times managed to get a foot to it before he could gallop away. He paid me the compliment of calling me a bloody nuisance?" Terry Dyson gave Spurs the lead in the ninth minute, and Blackpool could easily have conceded another three goals before Terry Medwin � deputising for injured Cliff Jones � made it 2-0 in the 37th minute. It was all over bar the shooting and the shouting in the 56th minute when Dyson nipped through a dazed Blackpool defence to collect his second and Tottenham�s third goal. Blackpool missed from the penalty spot before Jackie Mudie gave a flattering look to the scoreline with a goal in the dying moments of a game which had purists in the crowd purring at the subtlety and sophistication of some of the Spurs play. It was already clear that the precision passing of Blanchflower and White was going to be a key component. TEAM AND SCORERS: Brown, Baker, Henry; Blanchflower, Norman, Mackay; Medwin, White, Smith, Allen, Dyson. IT was back to Lancashire for what was expected to be a difficult assignment against a Blackburn team that had come out of the blocks quickly, winning their opening two games in impressive style and sharing top place in the First Division table with Spurs, Wolves and Sheffield Wednesday. The game was virtually all over in 17 minutes � with Spurs rushing to a 3-0 lead that left Blackburn bewitched, bothered and bewildered � title of one of the hit songs of the era. Bobby Smith started the dismantling of the Blackburn defence in the second minute, running on to a pass from Allen and slamming the ball past Rovers goalkeeper Bob Jones. Nine minutes later Smith struck again, rising above the Blackburn defence to head in a well-flighted, left-footed free-kick from Dave Mackay. Blackburn were in disarray, and Jones was picking the ball out of his net again in the 17th minute after Dyson had created an opening for Allen, who provided a deft finish. Two minutes into the second-half Blanchflower, bossing the midfield like an imperious war general, set Allen away down the inside-left channel, and his precise pass was smacked into the net by the alert Dyson. From then on Blackburn were forced to concentrate on damage-limitation, but they managed to catch Tottenham with a counter attack that produced a late consolation goal. QUOTE � Ally MacLeod, Blackburn winger and later Scotland manager: "Spurs played stunning football throughout the season, and were just sensational against us. I considered that Spurs side one of the best British club teams I played against. They were a joy to behold, even when you were on the receiving end. As a Scot I'm proud to point out that it was Mackay and White who made the team tick." Goalscorers: Smith (2), Allen, Dyson. THIS was Bobby Smith�s match. He hammered the Seasiders with a hat-trick that took him past George Hunt�s 1930s club record of 185 League and Cup goals. He might have scored more but for a series of magnificent saves by goalkeeper Tony Waiters, a Black-pool beach lifeguard. It looked as if Spurs were in for an easy night when Smith scored his first goal in the third minute following a winger-style run down the right touchline by captain Blanchflower. But, inspired by Waiters, Blackpool bounced back with an equaliser nine minutes before half-time when Les Lee turned the ball past Bill Brown from close range. The second-half belonged to Spurs in general and Smith in particular. He restored the lead with a reflex shot after Jimmy Armfield had cleared what looked a certain goal from Medwin off the line in the 51st minute. Barnstorming Bobby completed his hat-trick eight minutes from the end when he calmly controlled a centre from Medwin and slammed an unstoppable shot past Waiters. It was a goal that captured not only Bobby�s power but also his under-rated technical ability. He was much more than just a power-house player. There was method mixed with the muscle. Spurs were sitting proudly at the top of the table with a maximum eight points from four matches, with Wolves and Sheffield Wednesday breathing down their necks a point behind. SEPTEMBER arrived with the football world buzzing about Tottenham. Manchester United, still rebuilding after the tragedy of the 1958 Munich air crash and struggling in the relegation zone, were completely outgunned and fortunate not to get an even bigger hiding. Spurs were presented with a gift goal in the fifth minute. Maurice Setters committed the cardinal sin of passing across the face of his own goal. John White gratefully accepted the ball and immediately released it to Bobby Smith, who drove it firmly into the net past goalkeeper Harry Gregg. Blanchflower, White and Mackay were in total command in midfield, and set up a series of raids that culminated with Allen making it 2-0 in the 19th minute. Maurice Norman had a rare loss of concentration and Dennis Viollett cashed in on poor marking by stealing a poached goal that was completely against the run of play. It was the White-Allen combination that restored the two goal lead in the 69th minute, Les heading in a measured pass from the silky-smooth Scot who was establishing himself as the hidden ace in the Spurs pack. Defences just did not know how to pick him up and block his instinctive and intelligent blindside runs. Smith wrapped it up five minutes from the end with a rasping right-foot shot after the energetic Medwin had opened up the United defence with a probing run. QUOTE � Bill Nicholson: "We have got off to a satisfying start to the season, but nobody is getting carried away. Danny made those remarks about winning the double before the season started, but I have now stopped all that sort of talk. That is not my style. We will take each game as it comes. So far, so good." Goalscorers: Smith (2), Allen (2). Join us here next Monday for the next exciting instalment in Tottenham�s progress towards the �impossible� double. Each week while waiting for the kick-off to a fourth Spurs Odyssey Quiz League in August, I will set a weekly Tottenham teaser, just for fun and to keep you thinking about the club�s great history. Last week I asked: Who was the last Scot to captain a Tottenham team in an FA Cup final at Wembley? A lot of you jumped in and said Dave Mackay, when it was in fact Richard Gough in that unmentionable 1987 FA Cup final against Coventry City that still cuts deep with Tottenham supporters. First name drawn from the correct answers was Cornwall-based, Enfield-born Dave Williams, a Spurs fan since the Double year of 1961. 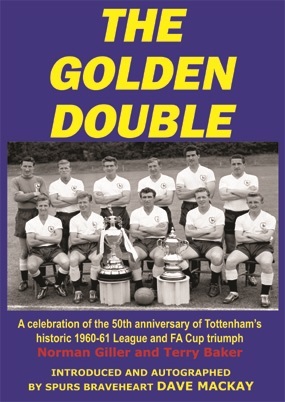 I will send Dave a screen version of my Spurs �67 book (you might consider buying a signed copy from me at http://www.normangillerbooks.com � all profits to the Tottenham Tribute Trust to help our old heroes � perfect Father�s Day present; drop a hint!). This week�s teaser: Which London-born defender won 44 of his 53 international caps while playing for Spurs and later appeared in the 1990s for West Ham and Brentford? Email your answer please to SOQLTeaser5@normangillerbooks.com. Closing date: midnight this Friday. I will send a screen version of Spurs �67 to the first name drawn from the correct answers.